Google has today announced that it is rolling out badges to help sites and individuals promote their Google+ presence on their own pages. 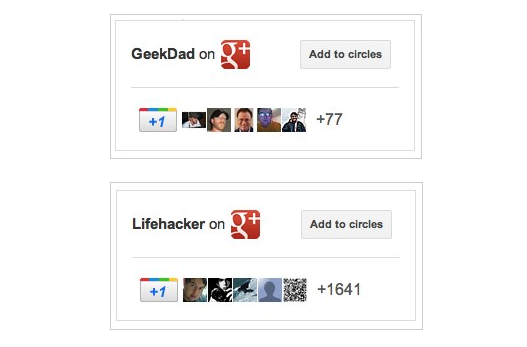 The badges take the forms of many of the Facebook and Google+ widgets we’ve seen so far and feature an ‘Add to circles’ button, an identifier and an ‘in circles’ count. When you add the badge to your site, you’re making it easier for people to +1 it, of course, and driving traffic to your G+ presence. But you’re also qualifying be default for the Google+ Direct Connect feature. This enables the operator “+Yoursite” on Google, allowing people to jump to and find your Google+ presence right from any Google search box. In order to get the Google+ badge now, you’ll need to sign up for Google’s G+ platform preview group, then head over to the new badge configuration tool to choose an appropriate badge size. You can, of course, follow us on our new Google+ brand page right here.